LAHORE: (Friday, February 8, 2019): Member National Assembly Mr Riaz Fatyana has said that Pakistan Psychological Council, which will be a regulatory body for betterment of psychological well-being of society, will be set up soon and bill has been moved in the National Assembly in this regard. He was addressing concluding session of International Conference of Applied Psychology: Practices and Interventions here on Friday. 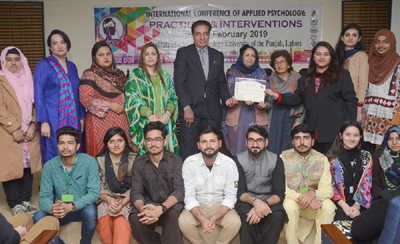 The conference was organized by Punjab University Institute of Applied Psychology (IAP) in collaboration with Higher Education Commission Pakistan, Punjab Higher Education Commission and Pakistan Psychological Association. Dean Faculty of Life Sciences Prof Dr Firdous-e Barin, IAP Director Prof Dr Farah Malik, Prof. Dr. Rafia Hassan, Prof. Dr. Akhtar Ahsan, Dr. Mujeeba Ashraf, foreign delegates comprising on psychologist, presenters, researchers from UK, USA, Australia, Spain, Greece, Ireland and other countries, faculty members and a large number of student were present on the occasion. Addressing the concluding session, Mr Riaz Fatyana said that psychologists could lead the nation and help resolve several issues including extremism, terrorism, illiteracy, poverty etc being faced by the society. He advised the students of psychology to pursue their career in civil and armed services and participate in competitive examinations. He said that foreign students should also be admitted at IAP. He appreciated the efforts of the Institute of Applied Psychology in the promotion of psychological issues at stake and motivated to continue the professionals to serve the general public. 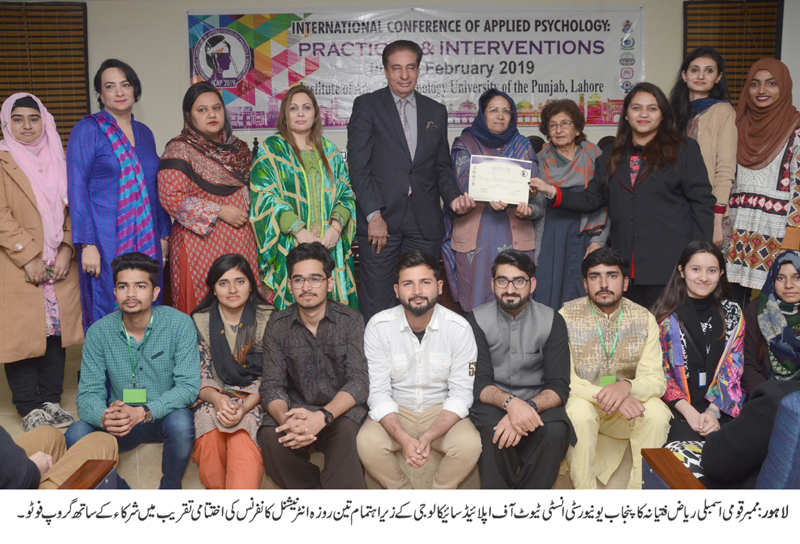 Dean of Life Sciences Prof Dr. Firdouse Bareen acknowledged the director and the faculty members of Institute of Applied psychology for their work and the remarkable conference. Addressing the conference, Dr Farah Malik said that this conference was first of its kind in the history of Institute of Applied Psychology. She said that our society was facing crucial social issues and there was need to identify reasons behind such problems and give solutions. She said that the conference had provided an outstanding opportunity for scholars and students from all over Pakistan and abroad to share latest research work and experiences with each other. She said that these academic activities will enhance the horizons of postgraduate, MPhil and PhD students and other participants including academicians, lectures and early career scholars. The last day of the conference began with the address of Prof. Dr. Najma Najam, Prof. Emeritus, Institute of Applied Psychology on Coming of Age in Turbulent Times: Pakistani Psychology at cross Roads. A symposium on Organizational Psychology was conducted by Dr. Muhammad Imran Qureshi followed by seven scientific sessions on various psychological themes. Condolence reference presided over by Prof. Dr. Rafia Hassan for Prof. Dr. Akhtar Ahsan. The Organizing Secretary, Dr. Mujeeba Ashraf thanked all the guests for coming and the faculty members for all their efforts in making this conference a success. In the end, souvenirs were presented to the guests and shields were distributed among the participants.